Last weekend the theme for Ludum Dare 28 was announced to be “You Only Get One”. Where I live, the theme announcement comes at 9 PM on Friday night, and I usually try to think up an idea then get some rest to start in the morning. This time, however, I had several other events that I need to attend, so I started work around 10 PM Friday night on my idea. 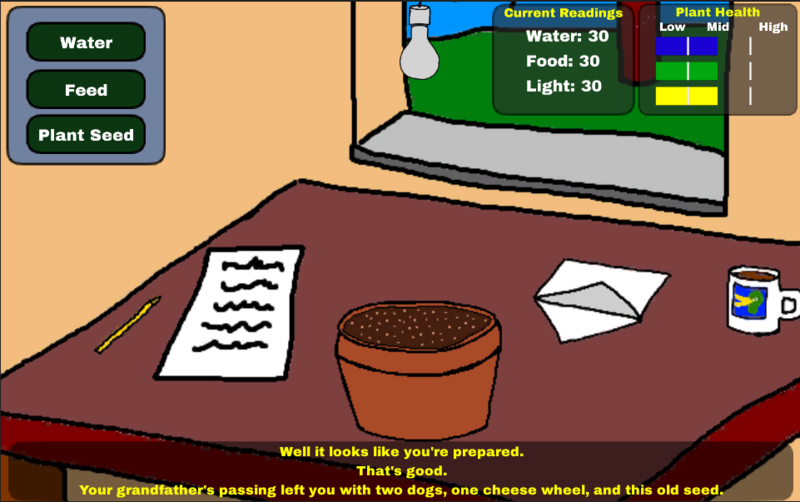 I’ve always wanted to do a gardening/grow game, and I felt it would fit the theme pretty well, so that became my task for the next 48 hours. My idea was that you would get this seed in the mail with a letter explaining that it is a unique one-of-a-kind seed which, when grown, could produce some unique fruit/berries that might have very interesting properties. I really wanted the plant to be in 3D, but after playing with Blender for the first hour or so, I gave up on it. Trying to get the plant to grow using a 3D model was something that I did not think I could tackle in 48 hours. With the 3D experiment a bust, I went to Paint .Net and began to create my 2D art assets. While I’m not an artist, I felt ok with how the graphics turned out. It has sort of a lo-fi old C64 game feel to it. I ended up losing a bit of time fixing a few bugs I found in some 3rd party libraries including one that appeared about 5 minutes before the submission deadline. That was a bit stressful, but I got it sorted out. The stories, 2 for each berry type, ended up being the most work. I first wrote down a list of berries you could grow along with a couple of sentences about what happened when you either sent it to the lab for examination, or ate it. Then I proceeded to add each of them to the game fleshing out each story which, in a few cases, got pretty long. In the end, I managed to get 15 berries into the game. That’s 30 separate stories. A few of them are pretty short, but still that’s not bad for the time given. 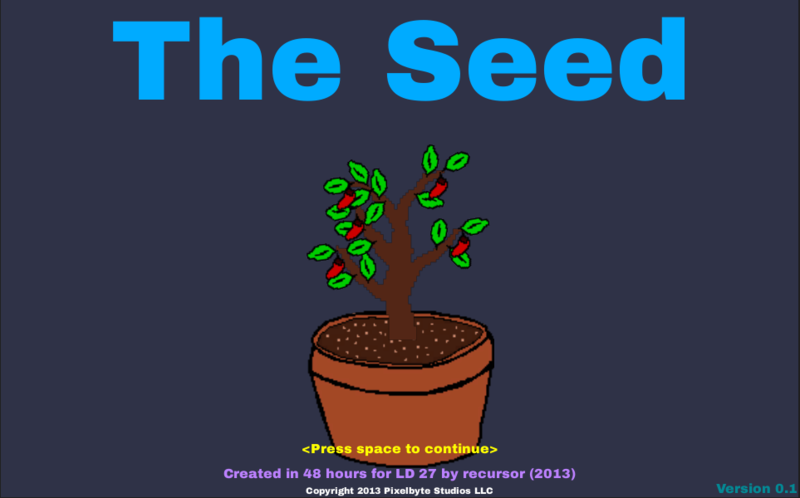 Click HERE to play “The Seed”, and check out the video below to see a time-lapse of the game being created.